The kiddos have fresh haircuts. The outfits are picked out and ready to go. I’m probably more excited than they are. Actually, my youngest is really excited, because she loves school and seeing all her friends every day. My son is excited, because he knows kids in his class and he’s memorized all the jokes from his Boys’ Life magazine and wants a fresh audience. 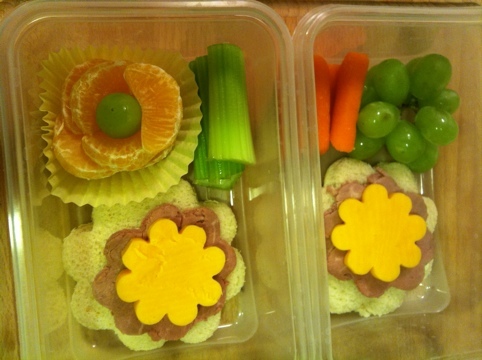 Because now is pretty much the only time I expect to be so energetic, I decided to make bento for the kids. I got the idea from Alphamom, because mommy blogs are built on the backs of other mommy blogs. During a Wal-Mart trip, I came across cheap plastic reusable containers. I mean, cheap. $1.44 for 4. They are approximately the right size, though I think they’d be better if they were less deep, but they’ll do until I make a trip up to the Japanese Mitsuwa market in Kearny Mesa. These aren’t as elaborate as this Pokemon bento or this Hello Kitty bento, but they’re pretty freaking elaborate for the likes of me. I took Alpha Mom’s advice and got a set of flower cookie cutters. I also have the Millennium Falcon sandwich cutter from Williams-Sonoma, which also came with a Tie Fighter and a Star Wars lunchbox, which Cadillac uses. It’s on sale for $9.99, by the way, as it was when I bought mine a few months ago. Two things: I feel bad about throwing out bread crusts and leftovers, so I put them into a plastic bag and stuck it in the freezer. When I have enough, I’ll process them into bread crumbs (theoretically, if I am not too lazy, otherwise some ducks might benefit). I saved the leftover cheddar to use in scrambled eggs tomorrow. The beef remnants went onto the boy’s sandwich. I know. My mom would be proud. My mother would always save the leftover rice and make onigiri, which I adored. I came up with these. They also get a Chocodile (which are basically Twinkies dipped in chocolate), a bag of chips, and a drink, so they shouldn’t get hungry. My son, who doesn’t care for fruit much, gets twice as many veggies because that’s the rule when you don’t eat fruit– eat more veggies. Margaret, these are so cute! 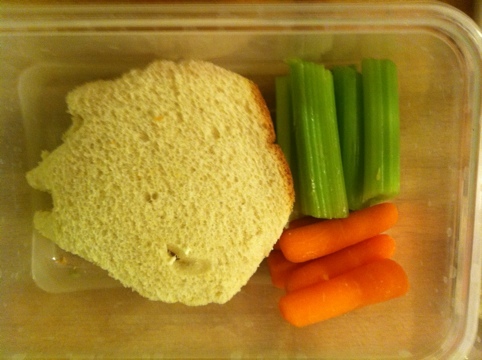 I might attempt this for Sophie’s first day lunch this week. By the way, I know what you mean about being more excited than they are. That’s me right now. 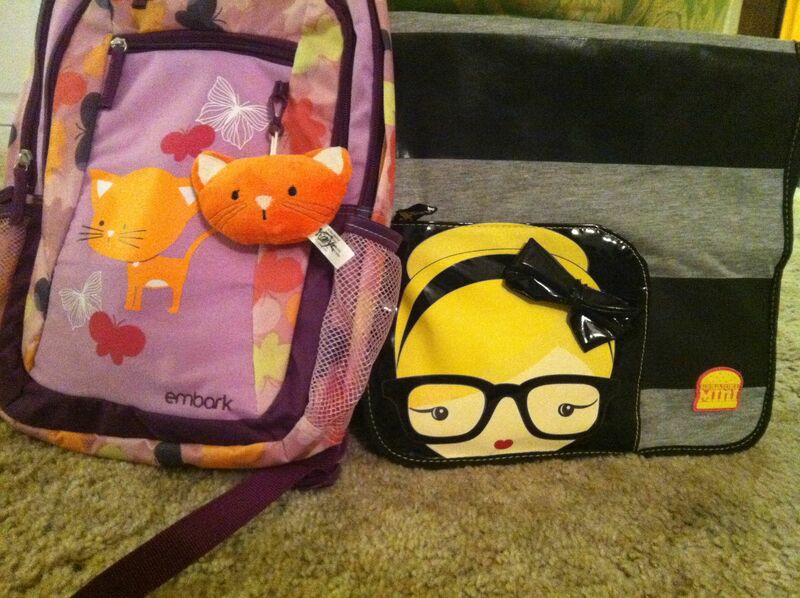 Oh, and Sophie has that exact same purple kitty/butterfly backpack from Target. She loves it.